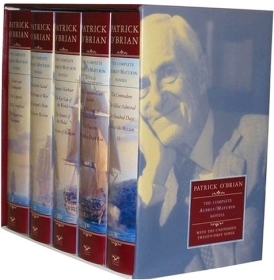 No less than a score of volumes comprise Patrick O'Brian’s series of “Aubrey/Maturin” Novels. A dream come true for lovers of naval adventures and historic novels, these books deal with two friends, Jack Aubrey and Stephen Maturin, and their high-sea adventures during the Napoleonic Wars of the early 19th century. I have so far read the first ten volumes, and I fully intend to read the rest. This review, however, presents only the first two books in the series. The first volume, Master and Commander, introduces us to Captain Jack Aubrey, of the British Royal Navy, and Stephen Maturin, medical doctor and (as we later find out) an intelligence agent. In the very first chapter, our two heroes meet by chance, in a concert, when one insults the other; but they quickly become friends, and as Jack is appointed Master and Commander of H.M.S. Sophie, he invites Stephen -- a landsman -- to join him as the ship’s surgeon. Sophie’s fantastic adventures are detailed throughout the volume’s 400-odd pages. O'Brian vouches (in the introductory Author’s Note) that, while Sophie itself and its sailors are all fictitious, these adventures did take place, by actual sailors and vessels at the time; the storytelling is based on extensive research. Some descriptions in the first volume is likely to leave you somewhat puzzled, unless you are highly familiar with sailing ships and their running. Never fear; things clear over time. In fact, the foreignness will help you identify with poor Dr. Maturin as he learns the ropes. The second volume, Post Captain, begins as a peace treaty is signed between England and France. However, the peace does not last long, and once again we join Aubrey and Maturin on their naval adventures. Unlike the first book, a large portion of Post Captain takes place on land, and I must admit that I found these parts of the book to be the most interesting ones. The plot of Post Captain is much richer and more fascinating than that of Master and Commander; it is one of those rare occasions where a sequel is actually better than its predecessor. O'Brian’s characters are very roundly described; the reader easily gets the feeling of knowing them intimately (though there are some surprises in store). Jack Aubrey, for example, often makes feeble attempts at puns; attempts for which he is very proud, and which he must point out to others as if he fears the pun will be missed: “The parson was playing a Handel fugue, the organ-boy deserted his post, and I said 'it would be a pity to leave Handel up in the air, for want of wind,' and blew for him. It was the wittiest thing!”. Captain Aubrey is certainly what you would call “a sea dog”, a man who feels better on sea than on land; the kind of man that, when he wishes to praise a woman he loves, likens her to a 32-pounder (a cannon). Dr. Maturin, in contrast, is a much more reserved person. He is often motivated by his love of nature, and his desire to “see the most philosophical things” - such as exotic animals and rare birds. He quickly becomes highly regarded as a doctor by his fellow sailors (most ship’s surgeons at the time were not doctors, but merely what we would call today paramedics), and a few of his successful life-saving attempts turn him into somewhat of a legend in the Royal Navy. By describing his writings in his secret diary, O'Brian allows us to see into his innermost thoughts, making him one of the most complex characters I’ve encountered in fiction. His secret career as an intelligence agent, and his acting behind the scenes on Aubrey’s behalf (in Post Captain), come as somewhat of a surprise to the reader, and are not even known to Aubrey. One cannot discuss the Aubrey/Maturin Series without noting the language used. The text itself is modern: for example, a gynandromorph beetle that Maturin had found is described (by O'Brian) as “a genetic freak”. But the text uses terms and phrases that might be unfamiliar to many readers (at least, they were unfamiliar to me). Most strikingly, the characters' speech, as well as writings (in letters and diaries), is highly true to the era described. Slang, phrases, and idioms are all accurately recreated. This is perhaps the most fascinating aspect of these books, together with the detailed description of daily life (and naval life in particular). Though the writing is, at times, a challenge for the reader, it makes reading these books a special experience. I’ve mentioned that Aubrey and Maturin first met in a concert. They are both music buffs; Aubrey plays the fiddle, while Maturin plays the cello. During their adventures, they often spend their time together playing musical pieces (some by composers I’ve never heard about before). Two music CDs, Musical Evenings with the Captain and Musical Evenings with the Captain: Volume II, attempt to provide the perfect musical background for reading O'Brian’s books. A relatively new addition is Musical Evenings in the Captain’s Cabin. Not only the language in O'Brian’s books is hard to follow at times; the course of the Sophie, and other ships under Aubrey’s command, isn't easy to follow either, unless you’re intimately familiar with Mediterranean geography. Harbors and High Seas is “an Atlas and a geographical guide” to the series. There’s also a guide to Persons, Animals, Ships and Cannon in the series, and most surprisingly, a book titled Lobscouse & Spotted Dog, which is nothing less than a “Gastronomic Companion” to O'Brian’s work (spotted dog, in case you worried, is merely a kind of pudding). If you’re familiar with the Aubrey-Maturin series, you might be surprised to hear that it now contains twenty one volumes. The new addition is titled 21: The Final Unfinished Voyage of Jack Aubrey, and it was published posthumously. In 2003, the movie Master and Commander - The Far Side of the World, starring Russell Crowe as Jack Aubrey, hit the screens. The movie publishers promoted the book The Far Side of the World; however, this is the tenth volume in the series, and I highly recommend reading the books in order.